Nir Jaimovich (Duke University) and Henry Siu (University of British Columbia) appear to have made a very interesting discovery. Evidently, there appears to be a very strong link between two much talked about phenomena: job polarization and jobless recoveries. 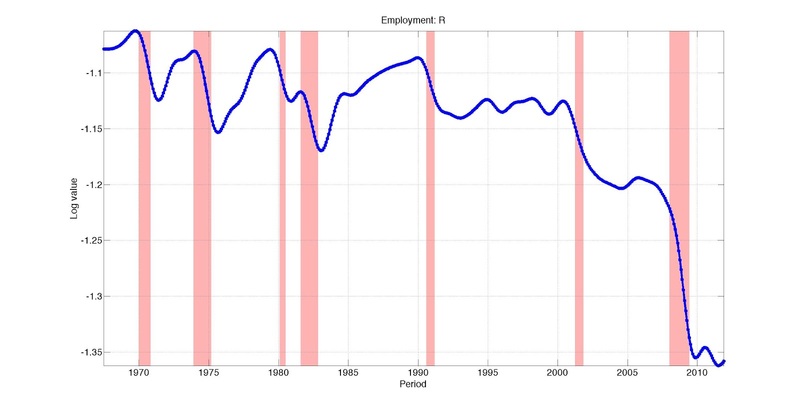 Their paper is available here: The Trend is the Cycle: Job Polarization and Jobless Recoveries. The figure above shows that across three decades, the share of employment in the middle of the skill distribution appears to be disappearing. Prime suspect: routine biased technological change (e.g., think of ATMs replacing bank tellers). 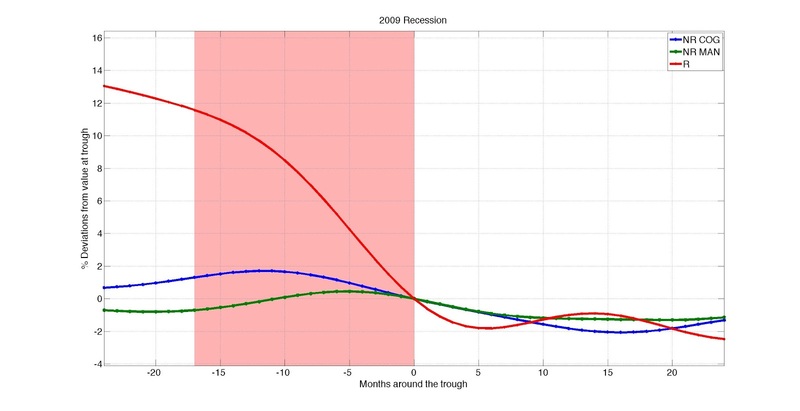 The x-axis is centered at "0," which represents the trough of the recession (using NBER dating). 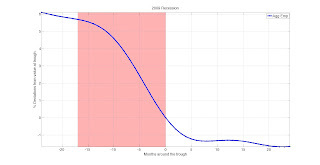 The data is plotted for 2 years around the trough date. The shaded region represents peak-to-trough. 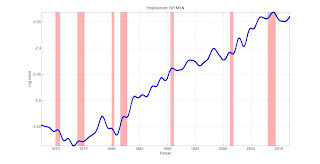 The y-axis plots the percent change in employment relative to its value in the trough. 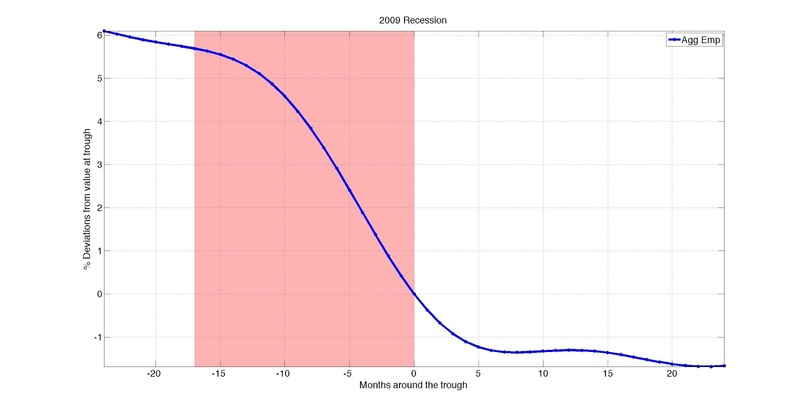 The figure above shows the rapid recovery in employment following the trough of the recession. Yes, but what's the link? So far, this all very interesting, but not very new. What is new is how the authors link the two phenomena. 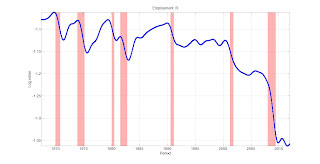 In this episode, the recovery in employment was strong across all occupation groups. In fact, the non-routine occupations appear to have grown throughout the recession! The key is the strong recovery in the non-routine class of occupations. 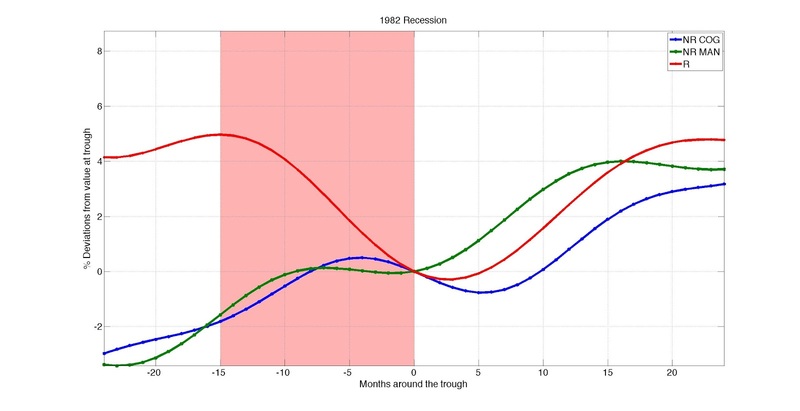 Roughly the same pattern is evident in the 1970 and 1975 recession as well. 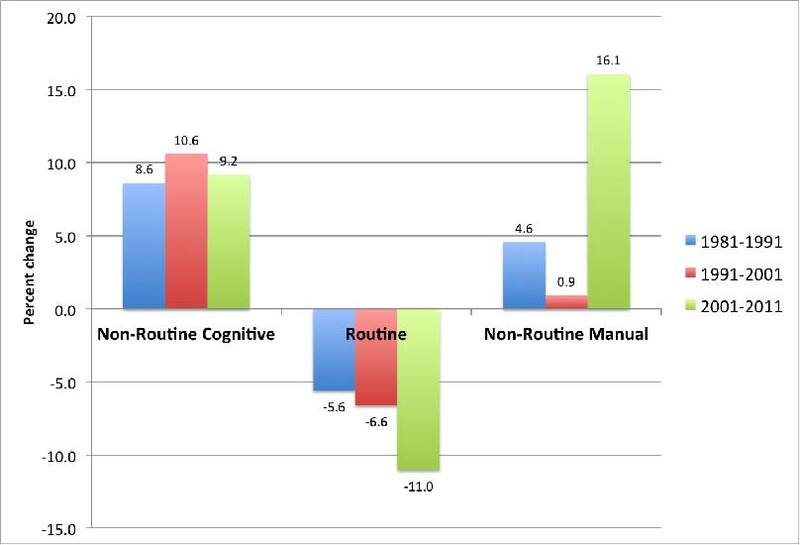 Here, we see hardly any movement at all in the non-routine occupations, but a significant and persistent decline in routine occupations. The relative weakness in routine occupations is evident in the 1991 and 2001 recessions as well. 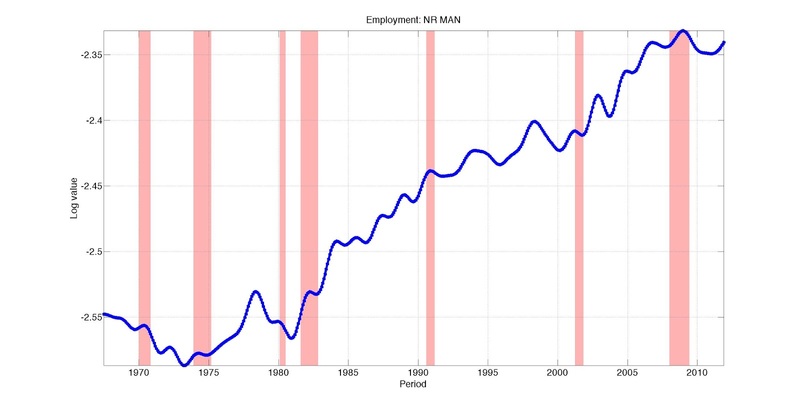 Moreover, because these routine jobs are associated with the middle of the income distribution, the data here suggest that job polarization is not a slow, secular phenomenon--it is intimately tied with the business cycle. 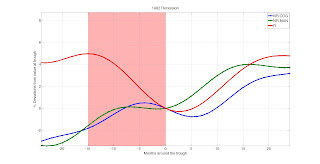 The work here is still very preliminary, of course, but the results look promising. Needless to say, it is hardly the last word on the subject. But I am confident that talented young economists, like Nir and Henry, will continue to shed light on the matter. Well done, gentlemen. Keep up the good work! I'm confused about something, and don't have time to read the paper. Non-routine manual are low-skill jobs? That doesn't sound quite right. For example, carpentry is manual and non-routine, and that's a high-skill (or at least middle) job. Can you clarify that a little? In this delineation, non-routine cognitive occupations include managerial, professional and technical workers, such as surgeons, construction managers, nancial analysts, computer programmers, and economists. Routine cognitive occupations are those in sales, and offi ce and administrative support; examples include cashiers, bank tellers, mail clerks, and data entry keyers. Routine manual occupations are blue collar jobs, such as machine operators, mechanics,dressmakers, bridge and lock tenders, cement masons, and meat processing workers. Non-routine manual occupations are service jobs, including janitors, gardeners, bartenders, and home health aides. Essentially the 'knowledge workers' are making themselves redundant, if not obsolete. Rather they have made themselves redundant already. Didnt they see the axe that they sharpened so much and so well, coming on their own head? Thanks David. It makes sense, I probably would have flipped the words, but I get what they're driving at now. This is definitely some interesting thinking, and I need to spend some time thinking about it. I like your Andre Gide quote, btw. David I don't see anything new here. We are essentially looking at the transformation from manufacturing to personal services. If you look at fraction of employment rather than absolute levels then you see that this has in fact been proceeding at the same rate since about the 1950s or so. 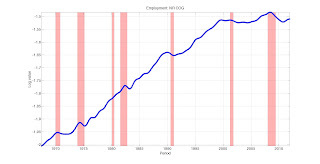 Even in the charts you posted you can see the routine group trending ever so slightly down from the beginning but note that it is trending down against an explosion in labor supply as the baby boom generation came of age and women entered the workforce. So relative to the surge in the top two charts the losses are not particularly exaggerated except for the 2008 rececession and indeed we have seen surprising strength in the routine sector since then. Even though it looks flat it is flat relative to flatness in the other sectors, where in past years it always performed far worse than the other sectors. Surely, some of this has to do with the transformation of manufacturing. 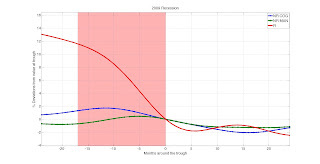 But what is surprising, to me at least, is how the significant adjustments take place during recessions. Btw, that employment data is relative to the population. (They took logs of the E/P ratio). I think the reason why the big adjustments take place during recessions is because that's when the errors of entrepreneurial (i.e. plan making under uncertainty) are revealed. At least, according to Austrian theory, that's when it happens. Btw, it's hard to be a neoclassically trained financial economist who does traditional work (that inflation paper I sent you a long time ago will finally be published in Economics Letters, btw) who is also pursuing Austrian econ. It's like living two lives. Weird. We are in agreement there - the recession bursts are big. However, check out this chart with logs of the Manemp to Payems, which unlike population controls for the rapid increase in the employment population ratio due to working women and prime age baby boomers. Ok for some reason that totally didn't work. Anyway Log(Manemp/Payems) will show a downward trend since 1950. 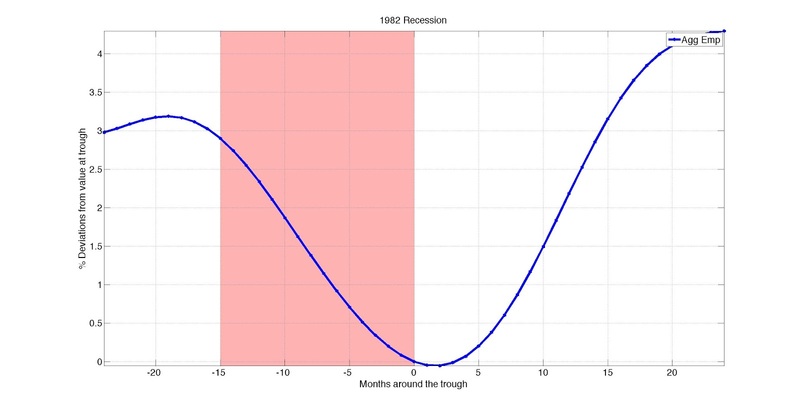 A little bit of acceleration after 1990 but then a marked deceleration during this recovery. They basically took 9 occupational categories from FRED and showed that 6 of them are cyclical and those 6 haven't seen a recovery. So this is far from a silver bullet. Still very interesting. well, I think the result of the paper is solid, and quite related to the change the labor productivity. What is amazing is the ciclical performance. On the other hand, this recesion is not comparable with all others. Some very big shocks have operated, and is possible that the dimenssion of these has play an important role in all variables. (Sorry)... On the other hand, I would like to see a comparison of the last graph with housing. Is it not possible that a big part of this employment was in housing? So it is saying a lot of the current unemployment while maybe initially spawned by the financial crisis is now, in reality 'structural'? I recommend that you bash your computer to bits. Send your next comment to me via snail mail. Thanks! Of all people you should know that no rule or law of economics states or holds that we can create new jobs that are as good or better than jobs destroyed by advances in technology. why does anyone think these trends are going to turn out well for anyone? How do you know what other people need? I say people need cheap manufactured goods from China and Vietnam. See how easy it is to announce things! David, I am wise enough to know, from your reply alone, that the ideal mind is the devil's workshop. 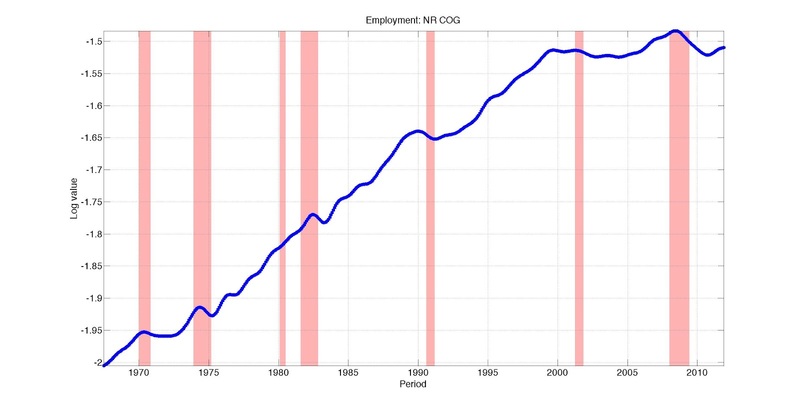 "as noted before, the computer is destroying lives faster than we can create new work"
"The figure above shows that across three decades, the share of employment in the middle of the skill distribution appears to be disappearing. Prime suspect: routine biased technological change (e.g., think of ATMs replacing bank tellers)."